[12/07/2016 @ 8:21 PM] Book this fare on: Priceline, Travelocity, Orbitz, CheapTickets, Expedia, BookingBuddy. [12/08/2016 @ 3:24 PM] Fare gone. Removing from deal list. 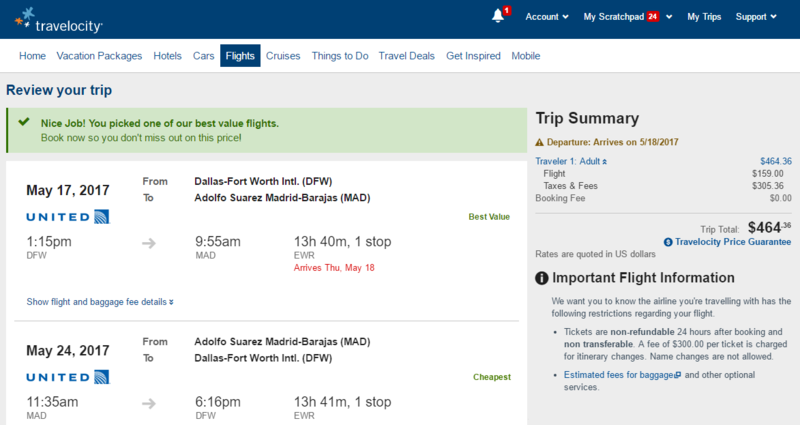 United has round-trip flights from Dallas (DFW) to Madrid (MAD) or Barcelona (BCN) starting at $454 with a connection. Flights scattered in May and June. Example Dates: MADRID: (Priceline / Travelocity) May 17 – May 24 / May 23 – May 30 / May 30 – Jun 06 / Jun 06 – Jun 13 / Jun 20 – Jun 27 / Other dates: Try midweek flights. Example Dates: BARCELONA: (Priceline / Travelocity) May 24 – May 31 / May 31 – Jun 07 / Jun 03 – Jun 10 / Jun 06 – Jun 13 / Jun 13 – Jun 20 / Jun 20 – Jun 27 / Other dates: Try midweek flights. I was able to pull this fare up on Travelocity, and it should be available on all of the major booking sites. Screenshot taken at 8:27 PM on 12/07/16.